50 percent of all businesses fail, don’t let yours be one of them! Running By The Mile 1 on 1 is a transportation business program for new and existing professional drivers ready to start their own business as successful owner operators. Do you want to stand out from the rest and be a successful business owner? If the answer was “yes” to any of these questions then you have come to the right place. This course Running by The Mile 1on 1 will give you the secrets to setting up a successful business, being a top professional driver, and the keys to a successful career in the transportation industry. 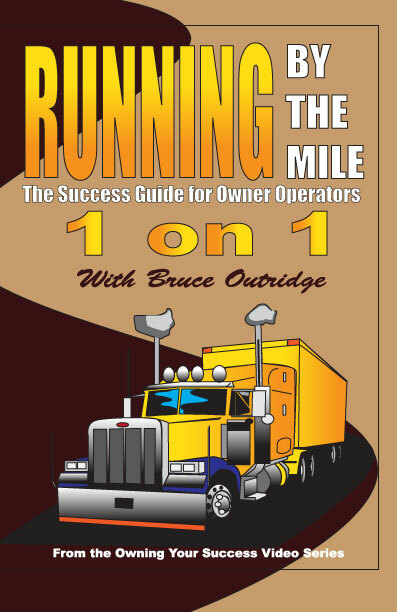 This course was designed by Bruce Outridge and is based on his book Running By The Mile. Another version of this course is currently taught in various career schools in the transportation industry. Leased vs Independent Operator, Business Plan Overview, Goal Setting Your Career, Evaluating Carriers, Setting Up Your Business, Purchasing a Truck, Operating Your Trucking Business, Saving Money as an Owner Operator, Expanding your Business, West Coast vs East Coast Operation, and much more! That’s just the course material. Included is the eBook version of Running By The Mile and Bruce’s leadership book for drivers called Driven to Drive in eBook version. If you would like to be contacted when it is available please send an email by clicking here. Pricing subject to change without notice. Get started with the right information and watch your business soar! info@outridgeenterprises.ca and we will answer any questions you may have?